Astia Inventius is an Imperial commoner living in Anvil, and the wife of hunter Pinarus Inventius. Astia was one of the several women in town who were cheated on by their husbands—a result of the Sirens Gang. Her necklace was, for some reason, held by Pinarus when he went to the Gang. It can be later found but never returned. She sleeps with her husband in the double bed on the top floor of their house between midnight and 6am and then wanders about the room for two hours before heading to The Count's Arms for breakfast. At 10am in dry weather, she heads to the docks and starts to paint the scene looking across the waterfront towards the lighthouse. 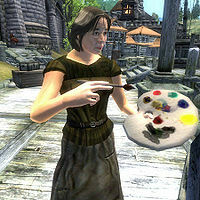 If it's raining, or starts to rain while she is painting, she heads back home and paces restlessly around the house. She will paint until 6pm if possible, then head through the city to a spot just outside the Horse Whisperer Stables, where she will wander for three hours. At 9pm, she heads back home and walks around until it's time for bed once more. While her husband walks around in his armor for most of the day, Astia wears a more relaxing outfit consisting of a dark green shirt, coarse linens, and a pair of clogs. She carries her copy of the house key, her paint brush, and a small amount of gold. Astia will greet you with: "Astia Inventius. Wife of the woodsman, Pinarus Inventius. Always out hunting. Anything to avoid doing a little work around the house." If you ask her about Anvil, she'll say: "Well, if you don't mind scruffy sailors smelling like bilge, it's a lovely town. The men are all the same, drunk and shiftless." Esta página foi modificada pela última vez à(s) 06h11min de 6 de julho de 2013.